Background: In present decades, interest in tetrazole chemistry has been increasing rapidly because of its broad range of biological applications, primarily due to the role played by tetrazole in medicinal chemistry as this moiety offer a more complimentary pharmacokinetic profile and a metabolically stable substitute for carboxylic acid functionalities. The heterocyclic tetrazole moiety has admirable biological, pharmaceutical and clinical applications. Method: There are various approaches available for the synthesis of tetrazole derivatives which are reported in the present survey. The most versatile method for the synthesis of tetrazoles is [2+3] cycloaddition reaction between nitriles and azides. 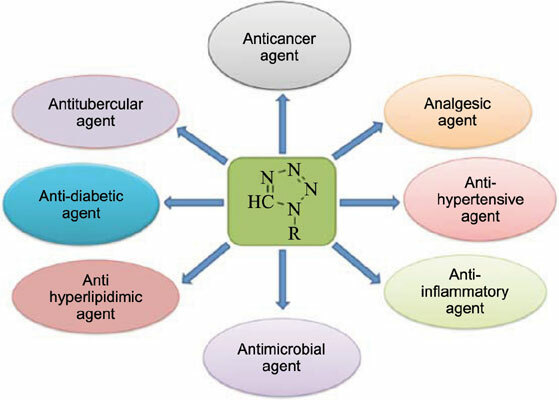 Observations: Among the family of nitrogen-containing heterocycles, tetrazole and its derivatives exhibit a large range of biological properties such as antibacterial, antifungal, anticancer, analgesic, anti-inflammatory, antidiabetic, anti-hyperlipidemic and antitubercular activities. The unique features of tetrazole, biological significance and applications are discussed in this review. Conclusion: The present investigation reviews the various synthetic approaches and different biological activity of substituted tetrazole derivatives. The rationale of this review was to pool literature work reported by researchers on tetrazole for their various biological activities and also reported current efforts made on tetrazole moiety. Tetrazole, synthesis, anti-inflammatory, anti-diabetic, anticancer, antibacterial activity.